Part 3: Blocking your knits, a must! Welcome to Part 3 of our 1-Skein Zigzag Cowl KAL. Part 2 is here if you're just finding the KAL. I am incredibly sorry for the delay in this post but I had my trade show last weekend and it felt like the work was coming from every angle! It was poor planning on my part and I promise I won't let that kind of thing happen again in a knit along. Anywhoooo... let me explain the mysterious world of blocking! Here's my happy little cowl fresh off the needles. It's pretty but it seems a little crinkly. Oh, yeah! Way too crinkly to wear! I don't want to put that over my head. This is where blocking comes in to play. I know knitters that are terrified of blocking but let me assure you that it is not that bad and it is actually a necessary part of knitting! See how it has a gentle drape? That's from blocking! And, I didn't do anything crazy either, no pins in this house! For Ewe So Sporty merino wool yarn and any other natural fiber yarns such as cotton, wool, alpaca and so on, you can basically wet your finished garment and let it dry. This relaxes the stitches and makes them settle in to place. In the case of Ewe Ewe Wooly Worsted and Ewe So Sporty yarns they can actually be thrown right in the washer but I don't always do that because sometimes I just have one or two items and a bowl in the kitchen uses a lot less water than a whole wash load! Soak wash or other gentle leave-in wool wash.
Place your cowl in the bowl, add a squeeze of Soak and fill the bowl up with water. Let your cowl get wet. Leave it in there for about 15-30 minutes until it's good and saturated. Lay out a towel and place your cowl on it. Make sure it's straight-ish so there's not any weird folds. Roll the towel up on itself. Make a big log roll and SQUEEZE and PRESS as you roll the cowl up inside. We're trying to get as much water out of the cowl as we can as gently as we can. Ok, now unroll your towel. Get a the fresh, dry towel and lay it out on a flat surface. Gently move your cowl to the new towel and smooth out any wrinkles. Lay it flat and straight. Now comes the most important part of blocking...patience. DON'T TOUCH IT. I mean it. Do not touch the cowl. Do not fiddle with it, don't stretch it, leave it alone. Let it dry until it is bone dry inside and out. Letting the cowl dry completely allows the fibers to lock in to their new positions. They have a new, knitted memory and they will be happy in their new home if you give them enough time to adjust to their surroundings. I promise! After proper blocking your cowl will look lovely, graceful and relaxed just like you when you're wearing it! Thank you for knitting along with me. I hope you were able to pick up a trick or two or at least had fun trying a new pattern. 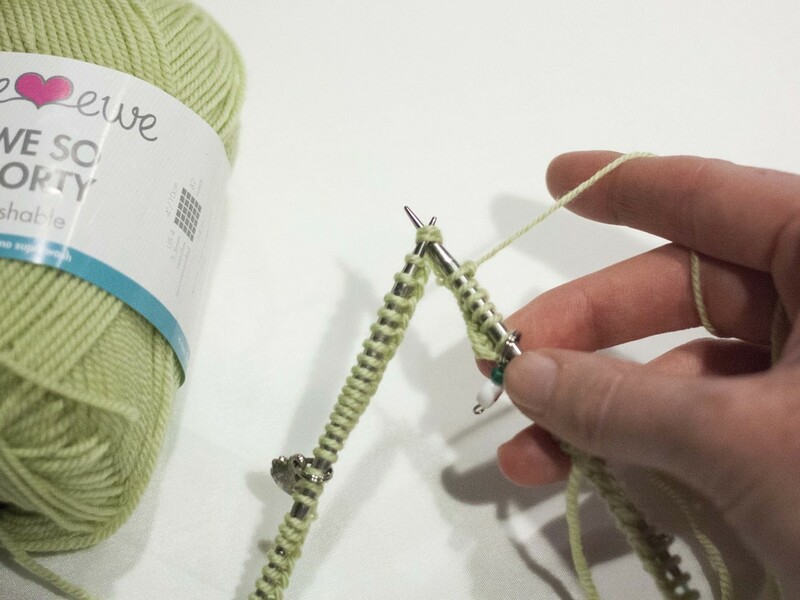 If you used our new Ewe So Sporty yarn I really hope you enjoyed it! Please send me pictures (heather at eweewe dot com) of your cowls or post them on Ravelry. How did the first 14 rows go for you? Isn't this a fun pattern to knit? I think it is. I love how each row shifts one stitch -- that makes me never want to put it down! But it gets better. Part 1 is here if you need to catch up. In this second part of the 1-Skein Zigzag Cowl we are going to move the stitches back the other way with one simple change, instead of a k2tog we are going to SSK. I know that doesn't sound like a big deal but it's a magical secret knitting move. Decreasing with a k2tog makes stitches lean to the right but an SSK makes stitches dance to the left. See, like this! **Nerdy knitting moment brought to you by Heather. Ha. Ok, so let's get this moving to the left. 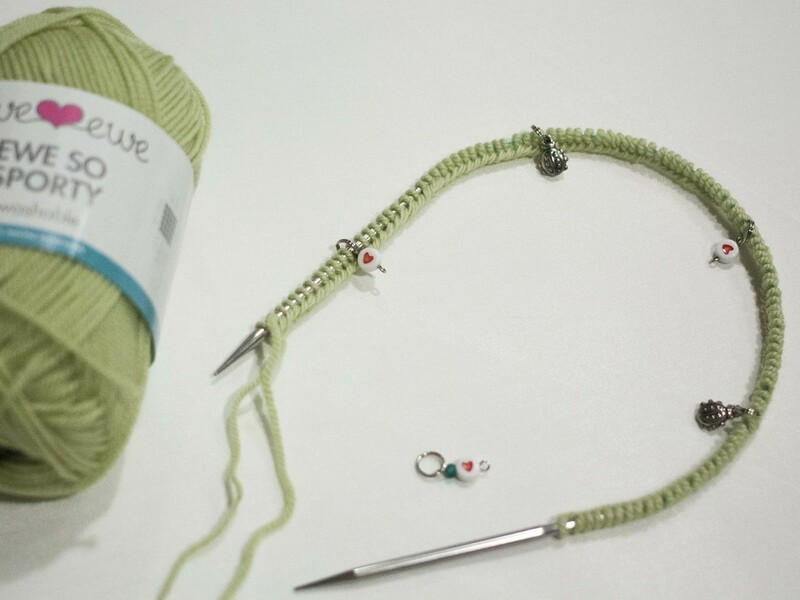 Our first step is a YO and since it's right by the stitch marker be sure it stays on the left side of the marker. Try not to let it slip to the other side because it will mess up your pattern. Next we work an SSK which is shorthand for slip, slip, knit. I like to use this slightly modified SSK that I'll show you here. I think it lays a little flatter and looks a bit more refined. 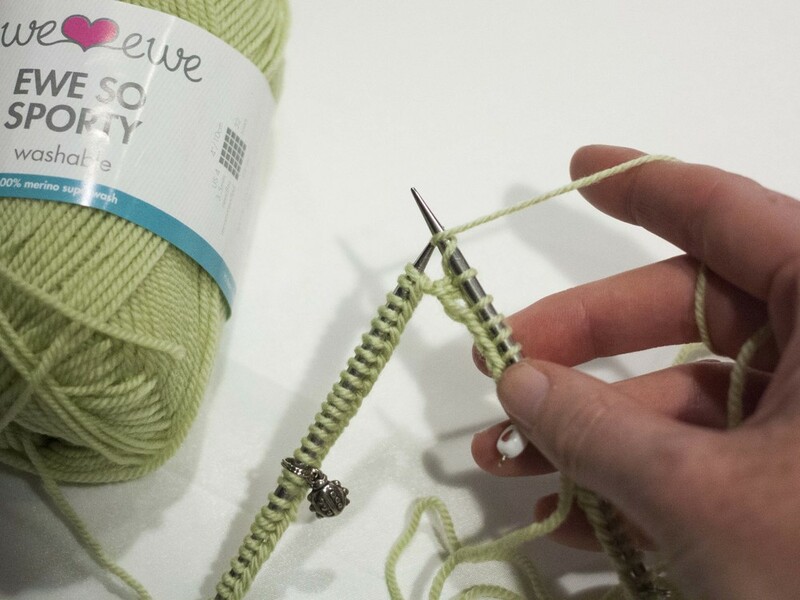 Step 1: Slip one stitch from the left needle to the right as if to KNIT. Step 2: Slip one stitch from the left needle to the right as if to PURL. Step 3: Put the lefthand needle through the front of the two slipped stitches and knit the two stitches together. Ta-da! That's an SSK! And as you can see, the stitches are already starting to dance back to the left to make those pretty zigzags. That's about all there is to it! I'll post again on Tuesday, April 29 with updates and progress photos. Plus, if anyone has any questions I'll post all the follow-up answers. Keep on knitting and please keep posting pictures with the hashtag #ZigzagKAL. Follow along by checking eweewe.com, Instagram, Ravelry, Facebook and Twitter. Pretty much anywhere! Happy knitting! Let's knit a pretty spring cowl! Our new 1-skein Zigzag Cowl in our brand new Ewe So Sporty merino yarn is soft and light and perfect for spring. 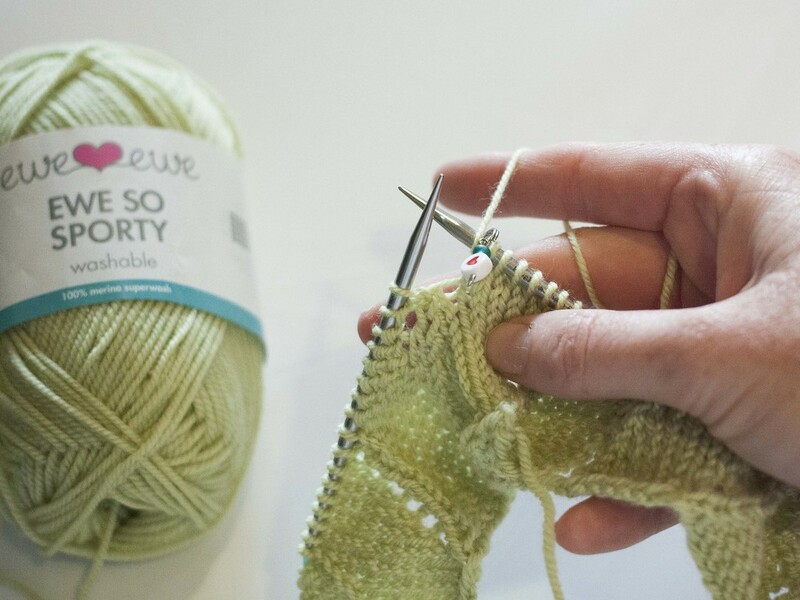 Ewe So Sporty is super soft and lightweight. Plus, our Zigzag Cowl has a lot of fun techniques that are good lessons for a new knitter but is also a great knit for a more seasoned knitter. 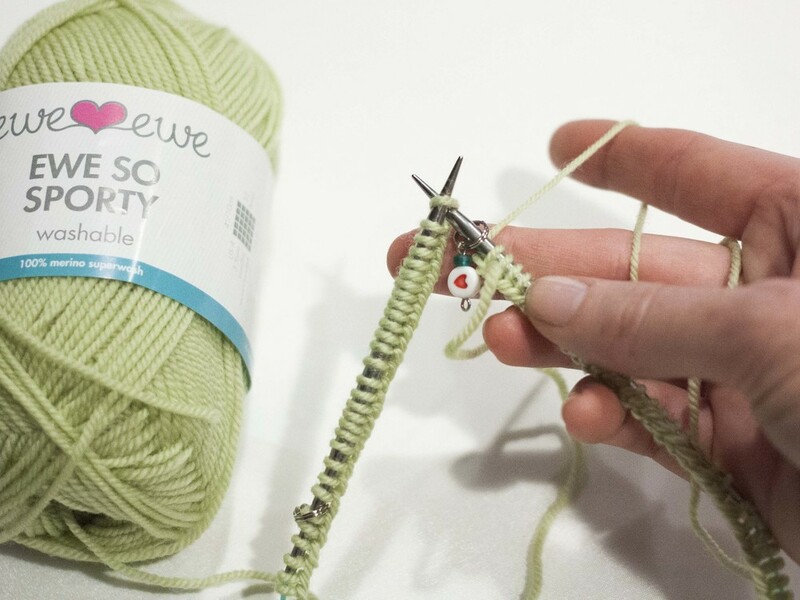 As the name suggests, you'll only need one ball of Ewe So Sporty yarn to complete the Zigzag Cowl! We have lots of pretty spring colors that will look great with any outfit. The Zigzag Cowl KAL is not as formal as some of the previous knit alongs we've done. I'll be showing you the basic steps of this cowl, things like the yarn over, K2tog and a fun trick for the SSK. And, the importance of blocking a finished knitted garment! Leave a comment here or in our Ravelry group and that's all there is to it! We start on Tuesday, April 22 and finish up on May 1. You can follow along by checking eweewe.com, Instagram, Ravelry, Facebook and Twitter. Pretty much anywhere! Be sure to post photos of your cowl as you knit or when your finished. Use hashtag #ZigzagKAL.